A crowd of some 120 people turned up to the latest Connacht Property Auction, held last Thursday in the Menlo Park Hotel. In total there were 24 properties offered for sale across Connacht including several Galway properties. With an 88 per cent sold ratio at the February auction and 92 per cent at the April auction, the auction team were expecting another big turnout and they were not disappointed. The auction room was full with the crowd spilling into the registration area at the back of the room. The first lot of the night was an agricultural holding in the Leitrim village of Keshcarrigan, which had more than a dozen parties registering interest in the lands. Bidding came in strong with several people raising their hand to bid for the first successful sale of the night. In total, 21 of the 24 properties were sold, giving the auction team an 88 per cent success rate on the night. Lot 2 was a former guesthouse Baymount House, Seaview, Clifden, which was offered for sale in partnership with Matt O’Sullivan auctioneers, Clifden. The auction team noted interest from local buyers and from the UK for this well located property. The premises were subject to strong interest in the lead up to the auction and were successfully sold for €355,000. The last lot of the night was a small two bed property located on New Street, Ballinrobe, Co Mayo, which was subject to significant interest and received eight bids. It was sold for €47,000 in partnership with Emma Gill Lettings & Sales, Ballinrobe. 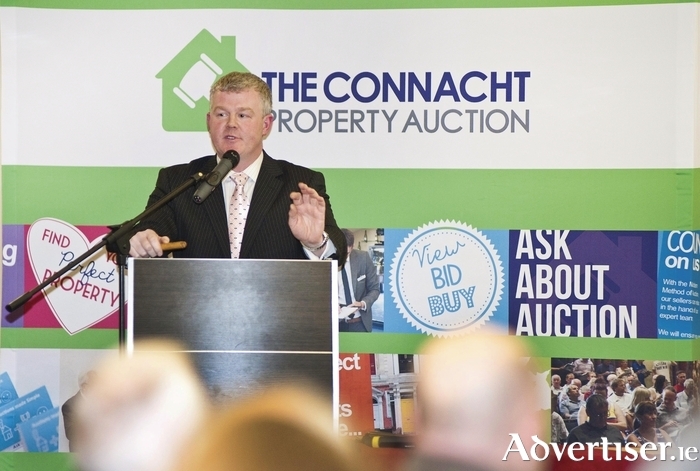 The Connacht Property Auction noted it had a large number of clients looking for properties in Galway city, Sathill/Knocknacarra, Oranmore, Athenry, Clifden, and Ballinasloe. In other areas there were a number of successful sales including Lot 5 located in Partry, (Westport/Claremorris ), Co Mayo, which was sold in partnership with O’Malley Properties, Westport, for €215,000. Another well maintained family home was successful sold in Monvana, Co Clare, for €187,000 in partnership with Pat Considine auctioneers, Kilrush, while a large two storey dwelling in Ballinamore, Co Leitrim, received bidding before the auction and was successfully sold in partnership with Gordon Hughes auctioneers, Ballinamore. The Connacht Property Auction is now welcoming entries for its 45 day online auctions and upcoming public auctions on September 17 and November 19. With a large database of registered buyers and the impressive success rate, The Connacht Property Auction is confident of further successful auctions during 2015.